Minerals Beginning with "F" and "G"
JC9785. Ferberite. Tazna Mine, Cerro Tazna, Nor Chichas Prov., Potosi Dept., Bolivia. 5.7 cm deep x 10.8 cm wide x 11.4 cm high. >1000g. $385.00. A large and well crystallized specimen from this noted Bolivian locality. Good pieces like this are virtually unavailable on the market these days. It has two broken crystals that keep it from being priced at over $1,000. One is on the lower left center and one is on the right side. JC9785. Another view, with the broken crystal on the left side easily visible. JC9785. I turned the specimen to an oblique angle view to show the broken crystal on the right edge of the piece. JC9785. Another view of the top most crystals. JC3714. Ferberite, quartz, phlogopite. Yaoganxian mine, Yizhang County, Chenzhou prefecture, China. 6 cm x 7.6 cm. 124g. $150.00 Doubly terminated 3.1 cm x 3.8 cm ferberite crystal. The ferberite has bright luster and perfect terminations with good luster. The left hand end of the ferberite is coated with phlogopite. There are a few other ferberite crystals embedded in the phlogopite. There are a couple of dolomite rhombs on the reverse side, with minor pyrite cubes. ON SALE, TAKE 20% OFF THE MARKED PRICE. JC8190. Fluorapatite, muscovite, schorl. Shigar valley, Skardu district, Baltistan, Gilgit-Baltistan, Pakistan. 7 x 8.5 cm 307g $200.00. A pink fluorapatite nestled in 4 cm muscovite crystals with a little massive schorl. ON SALE, TAKE 20% OFF THE MARKED PRICE. JC8190. Another view, showing the pink apatite crystal on the backside of the specimen. JC9462. Fluorite. Minerva No. 1 mine, Ozark Mahoning group, Cave-in-Rock, Hardin county, Illinois. 10 x 10 cm 284g. $150.00. Satiny luster yellow crystals, a rather dark yellow. JC9305. Fluorite, quartz. Yaogangxian mine, Yaogangxian W-Sn ore field, Yizhang county, Chenzhou prefecture, Hunan province, China. 7.5 x 11.5 cm 295g. $225.00. Ice blue, gemmy, glassy, transparent crystals on quartz crystals. The fluorites are up to 1.5 cm across. There are a lot of Chinese fluorites out there, so I don't normally have any on the site, this one caught my eye for its luster and transparency of the crystals...they look like light blue transparent ice cubes partially coating the matrix. JC9305. A close up view. JC5280. Fluorite. Huayllapon mine, Pasto Bueno, Pampas district, Pallasca province, Ancash department, Peru. 12 x 14 cm >1000g. $400.00. A 5.5 cm octahedron with smaller octahedron on cookeite. Minor damage to the larger crystals, visible in the photos. More of a rub spot than anything. JC5280. Another view. Ding visible on middle right edge of octahedron. JC5280. Another view, close up of main crystal. Ding visible on right edge. JC5280. Another view, close up of main crystal. JC5280. Another view, close up of smaller crystal. JC8664. Fluorite, quartz epimorph after calcite. La Viesca mine, Huergo, La Collada mining area, Siero, Asturias, Spain. 5.5 x 8 cm 56g. $250.00 Group of two transparent to translucent, slightly beveled fluorite cubes, with light zoning, are perched on contrasting clear to white sharp drusy quartz which is an epimorph after calcite. Shot in tungsten light. JC8664. Shot in diffuse daylight. JC8664. Back side. Although not clear in the photo, the top is vertical downward to the flat face along the base. Sort of an L shape when viewed from the side. JC8599. Fluorite. Deer Trail mine, Mount Baldy district, Cottonwood creek, Tushar mountains, Piute county, Utah. 5 x 6.5 cm 143g. $40.00. Light green crystals on etched calcareous matrix. JC8537. Fluorite, quartz. El Gaudro mine, Talampaya, La Rioja, Argentina. 6 x 9 cm 198g. $175.00. Nice group of rounded octahedrons, typical for this locality, on drusy quartz. Nice specimen from this seldom seen locality. JC8537. Another view. Back side. JC8170. Fluorite, quartz. Riemvasmaak fluorite occurrences, Riembasmaak, Kakamas, ZF Mgcawu district, Northern Cape province, South Africa. 6 x8.5 cm 114g. $50.00 Usually seen as intense green octahedrons, this specimen, a somewhat older piece, features dark to light green cubo-octahedrons of fluorite on a quartz matrix. ON SALE, TAKE 20% OFF THE MARKED PRICE. JC8014. Fluorite, quartz epimorph after calcite. La Viesca mine, Huergo, La Collada mining area, Siero, Asturias, Spain. 8 x 10 cm 89g. $150.00. Drusy quartz grew on a calcite crystal which is now gone, the cast is easily seen on the back side as shown below. Bright drusy quartz is host to four light purple crystals of fluorite. JC8004. Fluorite, apatite. Yaoganxian mine, Yaogangxian W-Sn ore field, Yizhang county, Chenzhou prefecture, Hunan province, China. 3.7 x 5 cm 65g. $80.00. A large greenish apatite crystal is host to a purple zoned fluorite crystal resting on its face. Unusual combo from here. ON SALE, TAKE 20% OFF THE MARKED PRICE. JC8004. Another view. The shape of the apatite crystal can be seen better in this photo. JC7987. Fluorite, mica. Yaoganxian mine, Yaogangxian W-Sn ore field, Yizhang county, Chenzhou prefecture, Hunan province, China. 2.5 x 5 cm 35g. $35.00. Light purple with very slight greenish tones here and there. Fairly clear crystals. Minor damage to main crystal on bottom edge corner. ON SALE, TAKE 20% OFF THE MARKED PRICE. JC7980. Fluorite, calcite. Elmwood mine, Carthage, Central Tennessee Ba-F-Pb-Zn district, Smith county, Tennessee. 9.7 x 10.7 cm cube. >1000g. $300.00. There is minor chipping along the edges here and there, and a chip out of the offset fluorite near the center of the fluorite crystal. The large calcite at the top center in this photo has the termination cleaved off, the two other calcites have very minor dings on them. The top calcite resting on top of the fluorite cube has the back side of the crystal cleaved off and also has a couple of minor dings. The corners of the fluorite are amber while the rest of the crystal is very pale purple. ON SALE, TAKE 20% OFF THE MARKED PRICE. JC7849. Fluorite, quartz. Yaogangxian Mine, Yaogangxian W-Sn ore field, Yizhang Co., Chenzhou Prefecture, Hunan Province, China. 3 x 5 cm $65.00. An ice blue, gem clear crystal with a purple center. JC7811. Fluorite. Erongo, Namibia. 1.5 x 4.5 cm 9g. $300.00. An elongated highly modified spinel twin and ? crystal; a very rare form of crystallization. Several views are shown of this unusual specimen. ON SALE, TAKE 20% OFF THE MARKED PRICE. JC7758. Fluorite, quartz, pyrite, calcite. Fengjiashan mine (Daye Copper mine), Edong district, Daye county, Huangshi prefecture, Hubei province, China. 3.5 x 6 cm 97g. $90.00 ON SALE, TAKE 20% OFF THE MARKED PRICE. JC7758. A little more light in this photo. JC7638. Fluorite, calcite, chalcopyrite. Huanzala, Huallanca district, Dos de Mayo province, Huanuco department, Peru. 2.3 x 3.5 cm 16g. $10.00. A clear, transparent crystal with white calcite growing on one end, and a tarnished chalcopyrite crystal in the lower front. JC3982. Fluorite, sphalerite. Gibralter mine, Naica, Chihuahua, Mexico. 6 x 6 cm. 194g. $50.00. Near colorless, clear crystals on a bit of sphalerite matrix. ON SALE, TAKE 20% OFF THE MARKED PRICE. JC2989. Fluorite. Colorado mine cemetery area, Castle Dome district, Yuma county, Arizona. 4.5 cm x 5 cm 107g. $5.00. A 3.5 cm cube which is grayish blue in tungsten light and greenish blue in daylight. Weird holes in the cube are caused by an unknown mineral that has dissolved away. The white spots are barite. JC1645A. Fluor-richterite, Wilberforce, Ontario, Canada. 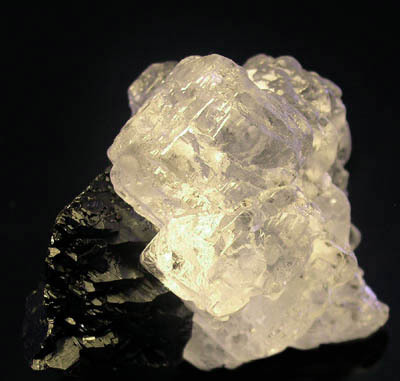 An 18 mm crystal in matrix. $7.00. ON SALE, TAKE 20% OFF THE MARKED PRICE. JC1645A. Another view showing crystals in matrix. JC8665. 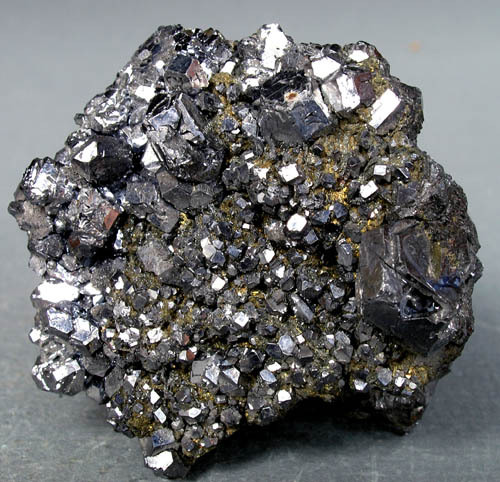 Galena, sphalerite. Tri-state district. Kansas, Oklahoma, Missouri. 4.5 x 5.5 cm 147g. $45.00. Cute group of cubes on sphalerite crystals. Ex: Gene & Sally La Berge coll. ; Ex Bob Seasor coll. JC8183. Galena, chalcopyrite, quartz. Pfannenberger Einigkeit mine, Salchendorf, Neunkirchen, Siegerland, North Rhine-Westphalia, Germany. 6 x 9.5 cm 147g. $110.00 A nice specimen from the famous locality in the Siegerland. The edges of the undamaged galena are slightly rounded. An old and classic specimen. JC7931. Galena, sphalerite. Blackstone mine, Shullsburg area, Upper Mississippi Valley district, Lafayette county, Wisconsin. 6.5 x 8.5 cm 260g. $200.00. 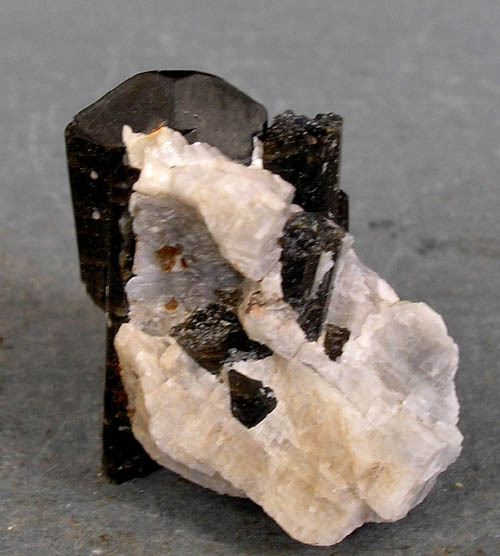 Bright galena cubes on sphalerite. Mine closed in the early 1970's, so the specimen predates this, but exactly when is unknown. JC7904. Galena, quartz. Georgetown-Silver Plume District, Clear Creek Co., Colorado. 3.5 x 4.8 cm 23g. $60.00. Not many of these have been preserved from this long closed district. JC7762. Galena, calcite. La Cruz mine? Linares, Linares-La Carolina district, Jaen, Andalusia, Spain. 5 x 5 cm 247g. $50.00. Very few specimens have come from this area, and this is a nice miniature. Back is coated with calcite. Russia. 6 x 6.5 x 8 cm 562g. $90.00 Nice combo specimen. JC7569. Galena on pyrite. Huanzala, Huallanca district, Dos de Mayo province, Huanuco department, Peru. 6.5 x 10 cm 487g. $75.00. Brilliant, rather modified crystals. No obvious damage. There has been a new find of galena and pyrite from Huanzala. Most pieces have some degree of damage...this one looks pretty clean. JC4719. 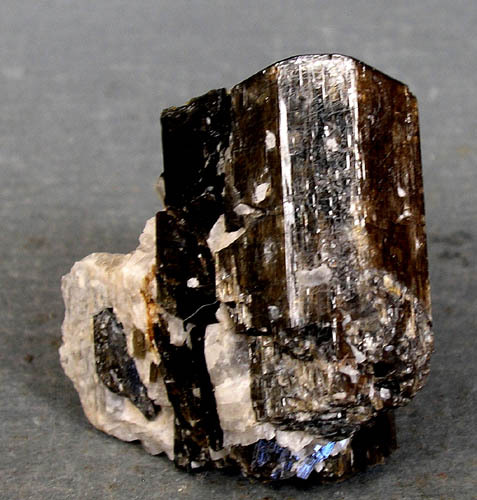 Galena, wurtzite. Huanzala, Huallanca district, Dos de Mayo province, Huanuco department, Peru. 4 x 4.7 cm 138g. $35.00. Silvery galena crystals are emplaced on somewhat bronze colored underlying wurtzite. Uncommon specimen from Huanzala. The wurtzites were found in one area of the mine in the 1990's, and no more has been forthcoming since. ON SALE, TAKE 20% OFF THE MARKED PRICE. JC8852. Gold (roasted). Cripple Creek, Teller county, Colorado. 2 x 2.5 cm 5g. $30.00. Gold roasted from tellurides most likely. RESERVED. JC9149. Grossular (hessonite). Mana Mine, Barang-Turghao (Mor-Darra), Bajaur Agency, Federally Administered Tribal Area, Pakistan. 6 x 6 cm 373g. $60.00. Gemmy, transparent crystals coating a white matrix. Most specimens from here are small groups of crystals without matrix. This one is somewhat different being on matrix. JC8908. Grossular. Genesee valley, Plumas county, California. 7.5 x 11.5 cm 736g. $50.00. Light brown, bright crystals on flat plate. Wish I had more of an exact location. Collected probably in the 1960's. JC8893. Gypsum (selenite). Salinas de Otuma (Salinas de Paracas), Otuma village, Paracas, Pisco, Pisco province, Ica department, Peru. 10.5 x 16 cm 393g. $175.00. Mass of golden yellow/ yellow orange, bladed crystals from the find of several years ago. JC8893. Another view. some of the crystals are transparent as can be seen on the upper left of the specimen. JC8893. Another view. Some crystals are twinned as can be seen on the middle right edge crystal. JC8848. Gypsum. Chihuahua, Mexico. 3.5 x 4.5 cm 19g. $5.00. Little group of bladed crystals. No exact location information. JC8194. 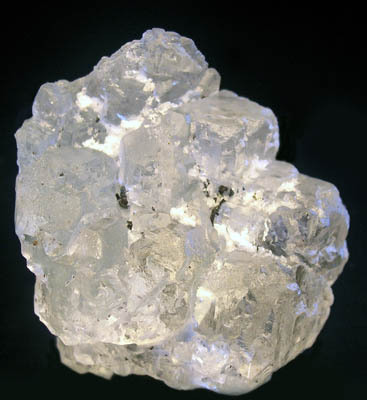 Gypsum (selenite). Kimberly mine, Robinson district, Ely, White Pine county, Nevada. 10 x 20 cm 568g. $100.00 A large plate covered with water clear selenite crystals. Here again, a rarely seen specimen from Nevada. ON SALE, TAKE 20% OFF THE MARKED PRICE. JC8019. Gypsum. Santa Eulalia district, Mun. de Aquiles Serdan, Chihuahua, Mexico. 9 x 14 cm 592g. $85.00. A nice large "fishtail" twin of gypsum. Minor dings on the termination (common with gypsum as it is so soft). Wish I had the mine name, but the label just listed Santa Eulalia. Nice large gypsum cabinet specimen. ON SALE, TAKE 20% OFF THE MARKED PRICE. JC7669. Gypsum pseudo glauberite. Camp Verde, Yavapai county, Arizona. 6.5 x 7 cm 183g $65.00. Excellent pseudo. ON SALE, TAKE 20% OFF THE MARKED PRICE. JC9751. Gyrolite, calcite. Pune district (Poonah district), Maharashtra, India. 2.2 x 4.5 cm 26g. $6.00. A couple of small dings on the calcites.